The OSS® ASN.1 Tools for Java, a powerful development package for building Java applications using ASN.1, delivers speed, flexibility, and a rich feature set. This flexible product includes a powerful compiler, a runtime library with high performance encoder/decoder engines supporting ASN.1 BER, CER, DER, PER/UPER, CPER/CUPER, OER, COER, JSON, XER, CXER, and E-XER, along with a number of utilities to simplify and speed your development. Our ASN.1 products support LTE Advanced Pro including NB-IoT, C-V2X and LTE-M. OSS products will support the 3GPP 5G specifications, which will be released in 2018. The OSS ASN.1/Java compiler accepts one or more input files, each containing one or more ASN.1 modules. The compiler verifies the ASN.1 specification, and generates informative diagnostic messages, Java classes for inclusion in your application, optional XSL stylesheets and/or DTD for XML encodings, and an optional ASN.1 output listing. Meeting the needs of today's developers, OSS' comprehensive compiler supports values, extensible types, and information object sets - must-have features if you need automatic decoding, or ASN.1 version handling. 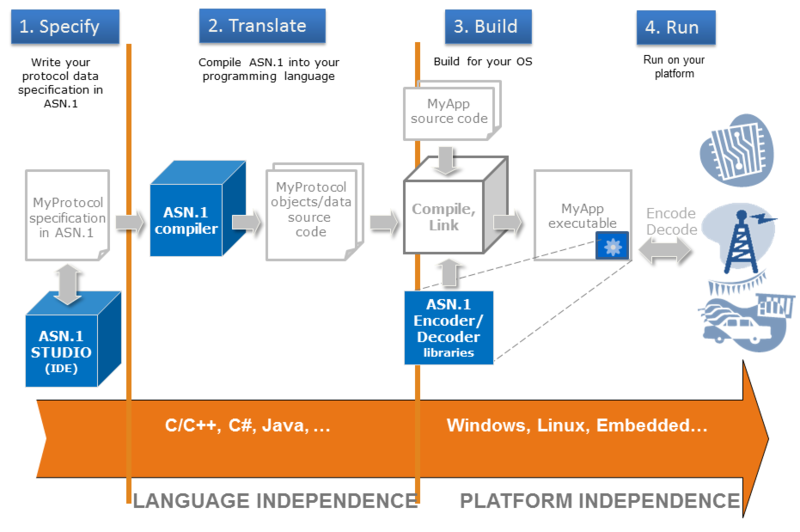 The compiler supports ASN.1:1990, ASN.1:2002, ASN.1:2008, and ASN.1:2015. The OSS Java Runtime Libraries provide encoding and decoding functions. Both the OSS encoder and decoder possess a wealth of tracing, error trapping, diagnostic and recovery capabilities, which can be dynamically enabled or disabled, making application development and debugging easier. If your application does not require the full range of functionality provided by the OSS ASN.1/Java Runtime Library, you may consider using the lean version of the runtime which is half the size of the full runtime library and runs up to 20% faster. The OSS ASN.1/Java Lean Runtime Library is included in OSS ASN.1/Java Tools. No implementation restrictions; never rewrite your ASN.1 to accommodate encoding limitations. More information about how to create, compile and link your ASN.1 application using the ASN.1/Java Tools. Download the ASN.1/Java Tools today!